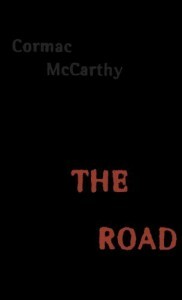 The Road, written by Cormac McCarthy, is a dark vision of a post-apocalyptic world. Where most stories of this genre offer some version of heroic survivors fighting marauders, aliens, mutants, or monsters in a revived, sun-drenched landscape or vacant cities, this story doesn't. The world is a charred ruin and nature won't produce. Human survivors fight over scraps. Heroism is subtle and hard to find beneath the overriding desperation and despair. This is dark material for a Pulitzer prize winner, but for all that darkness, it is compelling. I was drawn to the nameless protagonist's journey across a desolate landscape, trying to get his son to a safe place that likely doesn't exist. But his single-minded determination out of love for his son keeps him going, and kept me reading. I saw the movie version, starring Viggo Mortensen, a few years ago. It was a fine attempt and followed the book pretty well, but it didn't grab me the way the book did. I just found it depressing. I think this is a story best told in written prose since so much of it is the man's interior monologue and memories. Even the layout of the book supports the story. The book is a long series of short paragraphs with no chapter breaks (though there are section breaks denoted by unobtrusive lines of three dots). The reading mirrors the man and boy's journey--unending with no stops, only rests. The prose is simple to the point of being stark, like the world around them. Even the punctuation is reduced, with no quotation marks around dialogue and little use of commas or apostrophes (especially in contractions, so "won't" becomes "wont"). It's odd reading at first, but it works, and I had no trouble following the action or the dialogue. The setting is the near future after some vague apocalyptic event, or series of events, that seems to have involved great fires because ash is everywhere. It covers the ruined buildings, the ground, and is even mixed with the rain and snow, coloring the landscape in a gray pallor. The ruination of humanity's constructed world is complemented by the ruination of nature. Nothing grows. There are few animals since most have either died from disease or been eaten. The human survivors live off what they can find, and off each other. The man sees it as "The frailty of everything revealed at last." With the inability to produce food and disease widespread, the futility of the situation is constantly apparent to those survivors able to think ahead. It leads many to give up and take their own lives. The man struggles with that temptation. An old man he meets on the road expresses this futility with the opinion that "Things will be better when everybody's gone." So where's the hope in all this? What keeps the man from just killing himself and the boy? There really is no hope for the survivors. Nobody has found a means to sustain themselves when the leftovers of the old world run out. McCarthy seems to be saying that when we're stripped of all support systems, sustenance, and hope, we are left only with existence. And the only meaning we can find in that existence is in love for each other. "When your dreams are of some world that never was or of some world that never will be and you are happy again then you will have given up. Do you understand? And you cant give up. I wont let you." Hard words, but the boy needs to hear them. We need to hear them from time-to-time. Like a cold slap in the face, they keep us from falling asleep from the narcotic of our distractions. We need to stay awake and focused because there are others that depend on us.